You'll notice multiples of 9 all have the same associated symbol. The magician doesn't have to know your original number, only that your result will be a multiple of 9, which is how the trick is done. One of the stories wasn't about puzzles at all, but about football and the Wonderlic Intelligence Test. It seems LSU cornerback and candidate for the NFL draft Morris Claiborne scored 4 on the Wonderlic. Okay, okay. Many blogs and sports news tittered about it, slyly mocking or deriding. Listen, football isn't my game: It wasn't part of the sports programs at my small schools and play is so slow, watching it wreaks havoc with my ADD. Watching after-game highlights are fine, but in-game lowlights are as painful as watching golf or cricket before they made it look like baseball. It's wise to remember an adage: Everyone is my superior in some way. Morris Claiborne can take hits I can't and he'll probably make more money in a year than I will in ten. Moreover, he may be the kindest person or wholly honest or have admirable traits not factored into a test. But, from my criminally suspicious mind comes a serious question: If a score of 4 is considered six points less than literate, if the multiple choice should have randomly scored ranging 20-33%, how has Mr. Claiborne managed to pass his LSU courses? Have they done Claiborne any favors graduating a man who can't read and pass a simple exam? Wait… Is the test really that simple? Several sample questions are available on the web and I found a full set of fifty on Man Cave Sports, which drew from ESPN. Clearly not written by professional tech writers, the wording of several are awkward but parsable. A friend and I took the test separately. 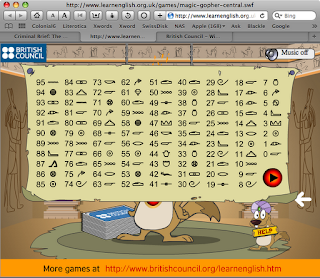 We each got them all, although not in the allotted 12 minutes, a task easier in high school, but not so easy now. Looking at the sample test, an error leaped out. If you want to see for yourself, it's near the end of the test, in fact, the very end. Not only is the wording faulty, the answer is incorrect. If this is an actual question and answer (which ESPN purports the test to be), then shouldn't we turn a critical eye on the exam itself? Who's testing the testers? If you want to take the test, after the break, I point out the error. 50) Divide 30 by half. Add 10. Multiply by 3. Add 6. What is does this equal? The given answer is 81. That is wrong. The correct answer is 216. Now my question is: how can we craft this as a murder clue? I got the answer 42. I assumed divide by half meant divide by half of 30. In any case, rotton question. I agree, Rob. 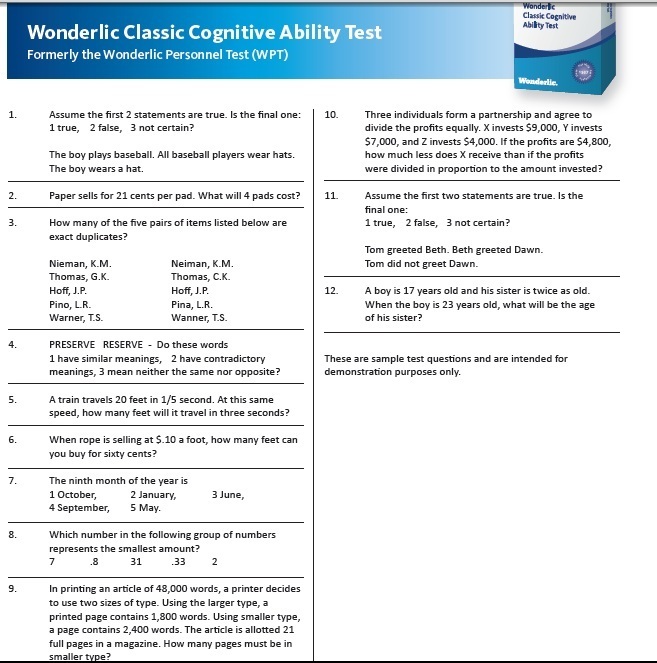 I thought many questions were poorly worded or even ill conceived, making the Wonderlic less than wonderful. The ninth month of the year is: (1) October (2) January, (3) June, (4) September, (5) May ? When I first read the question, I thought it meant take a half of 30, so I got 81. I wonder how smart are the coaches and general managers, and owners who draft players? The Tennessee Titians drafted Young and he was outstanding in his rookie season but for the next 4 years he seemed trouble. His coach Jeff Fisher didn't help much in the way he handled the young man. The article reminded me of the football player in the 1970s who graduated from Oklahoma State and couldn't read or write. The first thing he said he wanted to do when he retired from the Redskins (I think it was the team he played for) was to learn to read and write. Isn't that poignant, Louis? He so much wanted to become literate? I suspect owners are extremely smart. They not only get taxpayers to condemn land and buy stadiums, owners get special tax breaks, some similar to trusts. Think of it as socialism for the rich. Re: the poorly-worded math question, I have to say this sort of problem seems quite (frighteningly) endemic, these days, from what I’ve seen of my children’s school work over the past decade or so. Having grown up as the son of a civil engineering college professor, math was drilled into me until I learned to love its little quirks. Consequently, I’m constantly irked by ambiguous math questions on worksheets that my kids bring home, or even on exams they take in class. When I gently confront teachers with the equations’ error(s), their response lays bare the fact that not only grade school teachers, but sometimes even high school science and math teachers, do not understand how to properly examine the logic chain underlying the math they are trying to teach, or (at other times) even proper mathematical notation. One science teacher in my daughter’s high school, for instance, when using the Pythagorean Theorem (which states a² + b² = c² ), placed the “2” for “squaring” at the base of the letter being squared. This, of course, would not be read as “a-squared plus b- squared equals c-squared”, but would instead be read as “a-sub-2 plus b-sub-2 equals c-sub-two” — which has a completely different mathematical connotation. I was completely unable to get the science teacher in question to understand this difference, and that he was teaching improper notation. He had evidently received this instruction, himself, from some other math or science teacher in the past, and was convinced that I didn’t know what I was talking about. Refusing to be swayed by math text books that I dug out to show him what I was talking about, he instead insisted that “Well, that’s one method of doing it,” as if mathematical notation were not standardized! I find this new-found lack of proper methodology in math to be quite frightening, and believe it lies at the root of the error you point out in this post. That's awful, Dixon! The kids are being handicapped before they every take their SAT, no way a-sub-2 is the same as a to the power of 2. Little wonder we're lagging in math and science. My first two years of college I attended Rose-Hulman, which insisted showing how equations were derived and not using "plug-n-crank". I'm grateful for that. Thank you for the puzzles - I so enjoy a little brain teaser on Sunday morning.